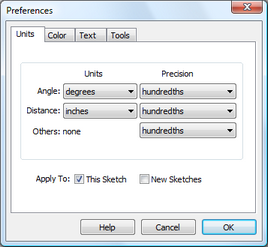 The units set on this panel apply to all measurements and calculations in the sketch. The precision applies only to newly created measurements and calculations. Use Value Properties to change the precision of an existing measurement or calculation. The unit settings on this panel also affect the units in which you specify angles and distances for translations and rotations in other dialog boxes. The choices for Angle Units are degrees, directed degrees, and radians. With directed degrees or radians, ABC has the opposite measure as CBA. With “plain” degrees, both of these angles have the same measure. Directed degrees are useful in transformational geometry, where the direction as well as the magnitude of an angle is important. Measurements in degrees are always positive and range from 0° to 180°. Measurements in directed degrees are positive for counter-clockwise angles and negative for clockwise angles. Directed degrees range from –180° to 180°. Measures of angles in radians are always directed and range from –π to π. Set the Distance Units to cm, inches, or pixels. A pixel is a single dot on the computer screen and usually corresponds to about 1/72 inch on Macintosh and 1/96 inch in Windows. Sketchpad’s distance measurements are accurate when printed, but may not be exactly accurate on the screen, depending on the size of your monitor and on the resolution you’ve set in your computer’s control panel. In the event that you require exactly accurate on-screen distance measurements, use the System Preferences panel to set the precise number of pixels per inch or per centimeter on your screen. This panel is available only in Advanced Preferences. The choices for each of the three Precision settings are units, tenths, hundredths, thousandths, ten-thousandths, and hundred-thousandths (0, 1, 2, 3, 4, and 5 decimal places, respectively). These settings only affect how numbers are displayed, not how they are represented internally.